With the UK's Freedom of Information Act now in force - what does it mean for the civil service and its supposed tradition of secrecy? 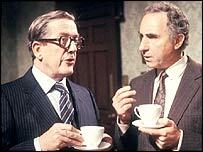 "My dear boy, it is a contradiction in terms: you can be open or you can have government," says the fictional Cabinet secretary Sir Arnold Robinson in Yes, Minister when asked about open government. The comedy series left an enduring caricature of the archetypal civil servant, particularly in trying to keep the public in the dark. Twenty-five years on, how fair is this depiction of secretive mandarins and are the openness laws going to eliminate the "Sir Humphrey tendency"? The Freedom of Information Act, which has just come into force, gives the public a new right to access thousands of files in government and other public bodies. It is by no means the first attempt to open up government. Harold Wilson's 1960s suggestion on releasing more information was met with a brief from two top civil servants which historian Peter Hennessy has said was "designed to make ministerial flesh creep". Under Jim Callaghan, there was the 1977 Croham directive saying all material should be published unless ministers deemed otherwise. Some officials of that period have said people only went through the motions before the initiative fell into misuse. 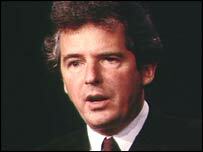 William Waldegrave introduced a code on open government under John Major in the 1990s. It institutionalised an openness regime for the first time but failed to satisfy the sceptics. In Yes Minister, the civil servants' view is clear: "It is only totalitarian governments that suppress facts. In this country we simply take a democratic decision not to publish them." Mr Waldegrave believes the fight against totalitarianism prolonged government secrecy. Britain was on a "war footing" for most of the 20th century, with World War Two succeeded by the Cold War. When he entered the civil service in 1971, he says the men at the top had retained the secrecy mentality that had helped them win the war. By the time of his openness reforms, Mr Waldegrave says there had been a "generational shift" and civil servants did not resist his plans. 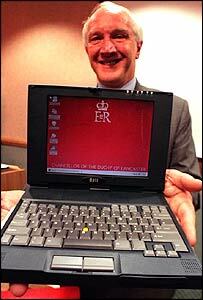 Indeed, then Cabinet Secretary Sir Robin Butler had backed the idea. "Much more of the resistance comes from the politicians nowadays but they don't like to admit it," he told BBC News. The former minister fears a new threat could be that departments may not have the right resources for proper record keeping now, particularly in an electronic age. Even now freedom of information is on the statute books, there are worries about the exemptions and the veto available to ministers, who nevertheless insist there will be a new culture of openness. David Clark, who as Chancellor of the Duchy of Lancaster produced the first drafts of the plans, says he is sad it has taken so long for the act to come into force. He says: "One of the main problems I had more than seven years ago in drawing up the White Paper was the antagonism of the senior civil service. I underestimated that. "Only afterwards did we discover the briefing that had gone on among very senior circles against it." Lord Clark believes the current Whitehall leaders are now used to the idea and have introduced tremendous training efforts. The rules should become "par for the course" in time and improve civil servants' work, he says. "Whatever they do - I'm not talking about advice, which is mainly excluded - they will have to think much harder about making their cases in case the information becomes public." Andrew Rawnsley's book, Servants of the People, contends that plans for the law were diluted because of New Labour's "culture of secrecy". "During the Kosovo conflict, Blair was horrified to learn from Bill Clinton that the American president dared not to have written advice from his military advisers for fear of public exposure," he writes. Anthony Seldon, co-founder of the Institute of Contemporary British History, argues the fear of leaks has already had a huge editing effect in the UK. "People are so aware of sensitive material being leaked anyway that it's not going to make that much of a difference because people are very cautious of what they commit to paper." That could apply as much, if not more so, to ministers, he says. The mass of material published through the Hutton inquiry also further reminded people of the danger of revelations in emails. Dr Seldon welcomed the Act - but stressed the importance of oral history. It is largely a myth that documents are going to reveal significant material which will change views of episodes such as the Falklands War, he argues. Ex-Treasury senior civil servant Sir Peter Kemp says he is not against the new laws but argues care is needed. "Government is a very, very difficult art indeed and necessarily contradictory," he says. He asks, for example, whether it would really be desirable for a country applying for aid from the UK to be able to peer at details of arguments between ministers over whether they should receive funds. He questions whether fear of ridicule from the media could prompt some officials to think: "I'm not in the business to push this view or another view because if I write my passionate memo to the prime minister then I'm not terribly interested in being done over later. " Such cases will be rare, he predicts, as most officials do not think very hard about the publicity value of their work. Sir Peter says the law could be a useful tool to serious historians but fears the media could concentrate on the trivia, as shown in recent stories on discussions about Whitehall lavatory paper or the Home Office's cat. "People will get used to it but whether they get used to it in an sensible manner or get used to it in a regressive manner remains to be seen," he adds. The new laws may allow much more access to civil servants' advice - but requests will be subject to a public interest test before documents will be released. The results of that test will determine whether Sir Humphrey is just going to have to loosen some buttons or have to do the "Full Monty".